A "global community"? Really? Is that what we are working for in this enlightened age? Whatever happened to rugged individualism, personal responsibility and personal property rights? Aren't those the tenets that made our country unique - not to mention great? We were not designed to be part of a hive. We were designed to be fully functioning, well-rounded, complete human beings, not dependent upon another group of people for our happiness or our survival. We have, within each of us, the ability to prosper and thrive in any number of situations. We adapt and we overcome. Early in the history of our country, we tried communal living. The Plymouth Colony was designed to be a utopia of civilized living. Neighbor helping neighbor, everyone getting an equal share. Widows who were unable to work would receive the same portion as the family whose members all toiled under the harsh conditions in the new country. Families with small children would receive the same allotment as families made up of young, strong healthy men. Everyone was equal. It was a true socialist utopia. It failed. Miserably. The first winter, nearly half of their number died. Their social experiment is described thusly;♠The experience that was had in this common course and condition, tried sundry years and that amongst godly and sober men, may well evince the vanity of that conceit of Plato's and other ancients applauded by some of later times; that the taking away of property and bringing in community into a commonwealth would make them happy and flourishing; as if they were wiser than God. For this community (so far as it was) was found to breed much confusion and discontent and retard much employment that would have been to their benefit and comfort. They began to reconsider their social experiment. After much consideration, they came to embrace private property and individual responsibility...So they began to think how they might raise as much corn as they could, and obtain a better crop than they had done, that they might not still thus languish in misery. At length, after much debate of things, the Governor (with the advise of the chiefest among them) gave way that they should set corn every man for his own particular, and in that regard trust to themselves; in all other things to go in the general way as before. And so assigned to every family a parcel of land, according to the proportion of the number, for that end, only for present use (but made no division for inheritance) and ranged all boys and youth under some family. This had very good success, for it made all hands industrious, so as much more corn was planted than otherwise would have been by any means the Governor or any other could use, and saved him a great deal of trouble, and gave far better content. The women now went willingly into the field, and took their little ones with them to set corn; which before would allege weakness and inability; whom to have compelled would have been thought great tyranny and oppression. All around, we hear the call to globalism. Our children are called to be "Global Citizens". We are obsessed with "Global Warming". Our legislators encourage our admittance and adherence to "International Courts". Our every day responsibilities are being usurped by state agencies under the guise of the "common good". We are forced to comply with emission standards for the "common good". Homes and business are seized under the auspices of eminent domain for the "common good". Our children are educated by the state for the state, so they will be good "hive" members rather than rugged individuals. Socialism has been tried. Many times. It has failed. Many times. People were not designed to be part of a collective. We were designed to be unique, individual. When we take that individual responsibility away, we take away the part of the man that makes him good. Without being responsible for ourselves and without the necessity to provide for ourselves we become lazy and indolent. When our personal property is stripped from us we no longer have the incentive to be good stewards. If it is not ours, we have no vested interest in how it is cared for. That goes for our homes, our jobs, our children. We are racing toward destruction. We are destroying our families, our communities, our country and our world. We have to take back property and responsibility - they are interwoven and cannot be separated. We cannot have life, liberty and the pursuit of happiness without property and responsibility. I don't want to be a good little "Global Citizen". I want to be a "Rugged Individual". 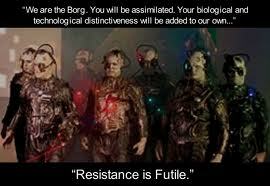 I believe that resistance is not futile. We can resist. We must resist. This is an attempt to take over our Republic from bottom up in addition to top down. All conspiracies aren't theories. Two examples I have encountered drive this "can't help yourself sheep" attitude home. In the grocery store. Two uncontrolled small children, running and yelling through the isles. They rounded a corner and smacked into my shopping cart. (I did NOT hit them, they hit me.) The boy (about 8 yrs.) plopped down on the floor and began to yell his head off. Mother arrived, angry at ME! "You're supposed to watch out for them!" She screamed at me. "No, YOU'RE supposed to watch out for them." I insisted. In a parking lot. Me, driving slowly as one should do in a parking lot. Woman carrying packages, looking neither left nor right, hurries on her important way, straight into traffic! I did not hit her, though it was a near thing. "You're supposed to watch out for me!" She screamed at me. "No, you're supposed watch out for you. Didn't your mother teach you how to cross a street?" I told her. My question is, just how many people am I supposed to watch out for? Why would it be my fault if someone can't see a 2000 lb. hunk of noisy Detroit Iron bearing down on them. Is there someone out there, watching out for me? Because I haven't seen the schedule yet. Who assigns who watches out for whom? Wouldn't it be easier if we each watched out for ourselves? really a great article...gives a whole nother meaning to "charity begins at home". and it should..because if we cannot take care of ourselves or our children, then we for sure can't take on any other responsibilities. and it sure would be a better world to live in if people would tend to their own troubles for a change, and just do what they should and need to do. Charlton Heston said it many years ago - his words are more meaningful today than when he said them. Copy and paste this link into your browser and watch the video clip. Listen carefully to his words. Then STAND UP to those who would take us down. Have courage. And pray. Rob-- I'm writing this one down. I'm sending it to my Senators and Congressmen. Another great article from you - Bravo ! We all need to draw encouragement from God & from each other. While we beware the influence of collectivism - we we should also recognize that how we can relate to each other in healthy ways. For example, radical individualism can also be destructive - by subverting the idea of Objective Moral Truth, leaving only subjective Truth - which robs us of the ability to relate to each other. If the common ground of Truth is forsaken, society won't perish with a bang - but with silence. Truths held in common, are essential glue of any culture. I am saying an 'AMEN' to your thoughts - but also warning of our need to have a robust Individuality, in a context of healthy Unity. A fundamental, yet neglected, Biblical theme that demonstates this is concept of "Unity with Diversity" - Common Truth that provides Unity, while maintaining a healthy Individuality. The New Testament revelation of the Trinity is the ultimate & best example. Our hand, physically, is another. Which one of our fingers can we do without ? Which child can we do without ? We only just 5, but each one is precious in their own unique, individual, yet connected way. Finding this balance is difficult. What you have exposed in your essay is the attempt of the world's system to subjugate our Unalienable God given Rights - via mindless conformity. This stutifying & supefying conformity then breeds fear - fear of being 'outside the group'. I see this as the main function of the media today - not to inform, or convey Truth, but to conform behavior of the masses, to the wishes of the elites, to create docile sheep - who crave the security of the welfare / warfare & nanny state. May we invite you to join us in thowing a wrench into the gears ? God, in His Providence, used their devoted self sacrifice to chart a new course - a Reformation, if you will. May many more be raised up for these challenging days ! May I add to the discussion, the Creed of the 3 % ers ? Not sure if you've heard it, yet. The best way to respond to a aggressive opponent like BORG is with the creed of the 3% ! 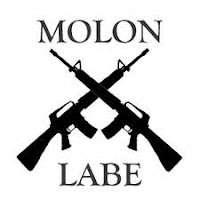 It might make more sense if I explain "Molon Labe", you logo refers to at the end of your essay. Texas Patriots, shortly after the tragic loss at the Alamo to Gen Santa Ana's forces, captured Santa Ana's Cannon, and when asked to return it (! ), they replied "Molon Labe" - and shelled Santa Ana's men, winning the day - known as the Battle of Gonzales. Great blog, by the way - tremendous content - modern Minutemen meet there everyday ! See you here & there !